I'm keeping my eye on the Instructional Leadership Act of 2007 H.R.3441 introduced in the House by Rep. John Sarbanes (D-MD) on August 3 which would authorize $100 million to develop innovative programs to train principals in instructional skills. In addition to training principals, this legislation proposes to incorporate those skills into state certifications and licensure and requires the U.S. Department of Education to develop a definition of a highly qualified principal (HQP). IN GENERAL- Based on the reports under subsection (f), the Secretary shall establish a definition of `highly qualified principal' that emphasizes standards of instructional leadership. demonstrate the capacity to lead in establishing and maintaining a professional learning community that effectively uses data to improve and personalize instruction for all students to result in improved student achievement. This proposed legislation validates the leadership development work we're doing in Michigan with the MI-LIFE (Michigan Leadership Improvement Framework Endorsement) Program funded by a grant from Microsoft Partners in Learning. Beginning in January 2008, Michigan educational leaders will have the opportunity to participate in MI-LIFE's professional learning courses that focus on the “Right Tools” the “Right Qualities” and the “Right Work” for school leaders. The curriculum is structured into learning units comprised of “just-in-time” units consisting of learning, collaborating, communicating and data collecting technology tools/applications, six courses that include face-to-face sessions with learner-directed intersession work, and two online courses. The program focuses on the skills, relationships and behaviors leaders must develop to be successful Digital Leaders, Data Leaders and Instructional Leaders. Built around the standards and benchmarks included in the Michigan School Improvement Framework and aligned with the work of McREL's Balanced Leadership responsibilities (Marzano, McNulty and Waters) and the Microsoft Education Competencies, MI-LIFE is intended to build statewide capacity among leaders centering on the same characteristics identified in the proposed definition of a HQP listed above. What I'm equally encouraged about by this proposed legislation is the possibility of the reinstatement of state licensure and certification for Michigan educational leaders. Authorization to issue Administrator certificates in Michigan was eliminated under Public Act 289 of 1995, making Michigan one of the few states that do not issue formal Administrator certificates to school leaders. Take the time to connect with your U.S. Representative to encourage his/her support for this important piece of legislation. It's clear that good instructional leadership positively impacts student achievement. The passage of H.R. 3441 will provide funding to help states, school districts, nonprofit organizations, and universities develop innovative programs so that principals will have the tools and training to be strong instructional leaders. The original Extreme Makeover was a television program from ABC in which individuals volunteer to receive an extensive makeover in Hollywood involving plastic surgery, exercise, new hairdos and wardrobes. Extreme Makeover: Home Edition began broadcasting in 2004 as a regular TV series in which a family's house, including all rooms, exterior and landscaping, is made over by a team of builders and designers in seven days while the family goes off on vacation. The idea behind EM: Home Edition is to put together a very run-down house, a deserving family, a team leader and several opinionated designers to build a new house, all in a race against time. The end result is that the lives of the lucky families are forever changed. 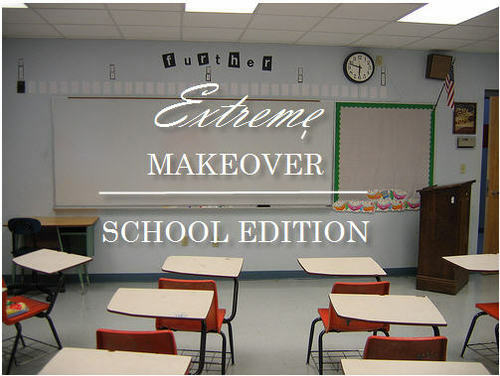 I am advocating for a spin-off of this series titled Extreme Makeover: School Edition where the makeover doesn't just change faces or facilities, it pushes the limits of what's possible in transforming education and the lives of the lucky students are forever changed. We have all the necessary "ingredients" to validate the need for Extreme Makeover: School Edition -- outdated systems and deserving kids. We also have a ton of experienced (and, yes, opinionated) educators. And we certainly are in a race against time. Graduation rates are falling, we are losing our edge internationally, and evidence suggests that schools are a long way from leveraging technology's potential. Our current system of education is not meeting the needs of our students. Statistics show that students dropping out of school don't do so because they are failing; they do so because they are disengaged, disinterested, and see their time spent in school as irrelevant. We are in a state of urgency to provide 21st century solutions so our children can successfully compete in a new global economy. Here’s my challenge: If you could contribute to the new series, Extreme Makeover: School Edition, what would you recommend for the next-generation school and why? TiVo has had the perhaps unintended result of its viewers skipping 70% of the TV commercials embedded in programs they have pre-recorded. 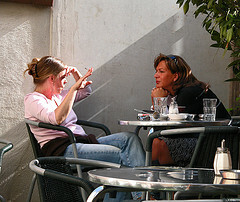 Advertisers have responded by going back to the basics--word-of-mouth communication. A recent Time article provides a brief background on the use of word-of-mouth communication for marketing purposes, focusing on Proctor & Gamble's Tremor division, which has used about a quarter millions teens to spread the word about shampoo and after-shave by mailing the participants free products and information packets. Encouraged by their success with this age demographic, P & G last year signed up a half million mothers in their new Vocalpoint program to "evangelize about pet food, paper towels, and hair color." These are unpaid volunteers who, provided with coupons and marketing materials, spread the word about P & G products. Many of you may already have ambassadors who carry your school's message into the community, but for those of you who don't, you might take a lesson from P & G's book. Why not provide parents with FAQs about your school district and ask them to be ambassadors for those thinking of moving into your district or for those parents seeking school of choice options. Worried about a backlash? They might say something negative instead of something positive? Not so, says Andrea Wojnicki, from the Rotman School of Management, University of Toronto. Her study, "Word of Mouth as Self-Enhancement," shows that evangelizers/ambassadors tend to associate themselves only with positive remarks about their product, and in becoming "experts" on the topic, feel good about their ability to make a recommendation. And in this Internet age, believe it or not, according to the Time article, 90% of WOM (word-of-mouth) communication still takes place off-line, 75% of it in face-to-face conversations. Educating parent ambassadors with an informational packet and encouraging them to recommend your school to interested parents will have a two-fold effect. You'll get some free marketing, and at the same time, some highly involved parents. The MACUL Conference (Michigan Association of Computer Users in Learning) is now over, but the attendees are still talking in their blogs and podcasts about the event. Imagine a hall filled with educators passionate about their teaching and learning, excited about a session they've just attended, mining the exhibition hall for new products and free samples, sharing handouts and information gleaned from a speaker, and promising to keep in touch after the conference. The most amazing part of the conference to me was the speed with which knowledge travelled...almost at twitch speed! How did this happen? Many presenters made their presentations available online which meant that anyone with a laptop in this wireless environment could easily access the information. In what format was the information available? Each of these twitch-speed technologies used to disseminate information is already being used in many classrooms. Check out some of these links and become informed! In a recent 2 Cents Worth blog posting, David Warlick expresses his outrage, "They are laying off librarians in Michigan, and BUYING LAPTOPS!" citing his source as one Michigan librarian with whom he talked, who as it turns out, is the president-elect for MAME, the Michigan Association for Media in Education, at whose October 27-28 conference Warlick was a presenter. MAME is a professional association of library media specialists. Nothing could be further from the truth! The funding for staff positions and Michigan's 1:1 Laptop initiative, Freedom to Learn, are from two completely different sources; the first from the school district's general fund and the second from federal and state allocations that are specifically dedicated to this initiative. In other words, the money to purchase laptops can not be used to pay for staff positions. The importance of librarians is not my issue here. I certainly support Warlick's contention that "both are important." In fact I believe both are critical and I'm sure there is more current research to support the importance of school librarians than the 14-year old citations in his posting. My concern is misleading information from which readers draw inaccurate conclusions and, in this case, negatively view our state and perpetuate dissatisfaction with the "system." Perhaps the culprit in this instance is the school district for not properly communicating with staff the reason for layoffs and clarifying the differences in funding sources for equipment purchases and personnel. Regardless, as educators, we continually whine about the media dragging us down with misinformation, partial truths, and negative press. I would hope that our valuable educational blogs don't begin to do the same.